1. Put the coriander seeds in a small saucepan with the oil and mustard seeds. Warm over a low heat for 3-5 minutes, or until the seeds start to pop. 2. Meanwhile, mix the kiwis, onion, nigella seeds and jalapeños together in a bowl. Mix in the oil and seeds, then add the lime zest and juice, coriander and seasoning. 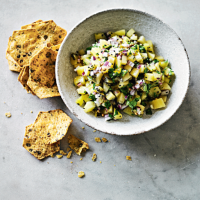 Serve with prawns, squid, fish or chicken, or with tortilla chips for scooping.